Yamaha won a race after a gap of 25 races as Vinales stepped on the top step of the podium at the Australian Grand Prix. 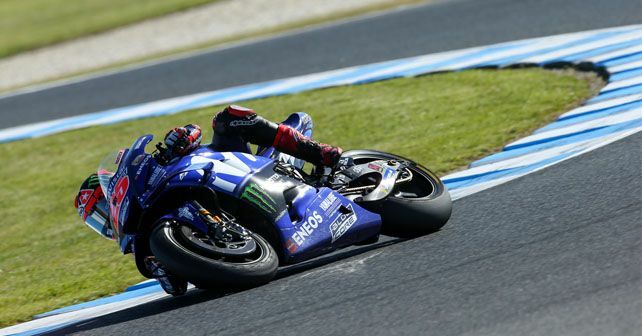 Maverick Vinales ended Yamaha's winless drought by taking victory at Philip Island in Australia. The Spaniard won the race in a dominating style, ahead of Suzuki's Andrea Iannone and Ducati's Andrea Dovizioso. Given the fast and flowing layout of the circuit, it was seen as Yamaha's best opportunity to take their first win of the season at Philip Island. Not to mention, a win here would also break the team's longest winless spell of 25 races. But, of course, the recently crowned champion, Marc Marquez, would pose a threat as always, and then there was Iannone, who looked in superb form in the practice sessions. In the qualifying, however, Vinales at least managed to beat the Suzuki man as he sealed the second spot behind pole man, Marquez. Tech 3 Yamaha's Johann Zarco grabbed the final spot of the front row. The opening laps of the race were a usual MotoGP affair with all the top riders swapping the lead as they were all stacked together. Vinales, yet again, had a horrible start as he dropped back to P10. Up ahead though, Marquez and Zarco tangled in a nasty high-speed collision on the main-straight, ending with Zarco crashing out and Marquez retiring owing to the damage on his bike. This left Dovizioso, Iannone, Vinales, Valentino Rossi, Alex Rins and Alvaro Bautista fight it out for the win and podium battles. At this point, Vinales sliced his way past the rest and was quick to check-out as he hammered a series of 1:29s lap times, which were more the three-tenths a lap quicker than anyone else. The Movistar Yamaha rider increased his lead lap after lap. Behind, Bautista, who was riding the factory Ducati as a replacement for the injured Jorge Lorenzo, was absolutely phenomenal in his first race outing with the factory bike. He was fighting for the podium with Dovizioso and Iannone till the very end of the race. His performance only faded in the last laps. Vinales took a comfortable win but behind him, both the Andreas fought tooth-and-nail for the second place. However, it was Iannone who got the better of Dovizioso in the end. Bautista finished fourth, while Rins beat Rossi to take the fifth position. The local boy, Jack Miller, finished in seventh, ahead of Franco Morbidelli of Marc VDS Honda in eight and Aprilia’s Aleix Espargaro in ninth. Red Bull KTM’s Bradley Smith rounded out the top ten.